Wow! Without a doubt, the highlight of the 2007 breeding season in Ohio was the discovery of a pair of Mississippi Kites nesting at the Brass Ring Golf Course in Hocking County. First discovered back in June by Rick Perkins, a skilled birder who just happened to be there on a golf outing, the kites have become avian celebrities and many birders have come to visit. When Rick first found them, he saw two birds and even watched them copulate - always a good sign of potential breeding :-) Word soon got out, but relatively few people were able to spot both birds with certainty. For a lengthy period in July and into August, only one individual was seen at any one time, and it appeared that either the other adult had left, or it was sitting on eggs. Because telling the sexes apart is not easy, it was hard to tell if everyone was seeing the same bird or both adults, just at different times. Fortunately, the bird(s) could almost always be observed from Keller Rd., which runs adjacent to the course. It just would not have been possible to allow access to everyone into the depths of the golf course, where the birds often hung out and into the vicinity where we suspected the nest was. Not only would lots of people on the fairways honk off the numerous golfers that use Brass Ring, it would have not been feasible froma liability point of view. I developed a rapport with the manager, Chad Galloway, who became quite interested in the birds, as did some of his employees. We asked Chad to let us know if anything at all changed with the birds, and to be especially alert for signs of nesting. Last Tuesday, he called to report that he had seen three birds together, which needless to say was exciting news. He further reported that one of the birds was quite vocal - typical of a young kite. So today, Aaron Boone, Scott Albaugh and myself drove down there to check things out. Within a few minutes of arriving at "ground zero" within the course, we saw an adult kiting high overhead. It wasn't long after that we spotted "Junior" as he came to be known. From then on, we were treated to long looks of the juvenile as he begged for food, and was brought scrumptious morsels of cicada on a regular basis. Junior still had down feathers protruding, and probably has not been out of the nest very long, but he can fly pretty well. Still has a ways to go in the bug-catching department; we saw him take a crack at an unidentified large butterfly but he choked badly. We got many photos, and Aaron with his digiscope rig really pulled out some awesome ones. He gave me permission to share some of those here. Here we have Junior, high in the boughs of a Shagbark Hickory, begging for food as the adult looks on sternly. Junior would sit up there for long periods, and when he spotted an adult would start to give a two-toned whistle reminiscent of an Olive-sided Flycatcher. His whistling would increase in intensity as the adult neared. You can make out the insect in the adult's bill, which is probably a Swamp Cicada or some other large species of cicada. We were able to see the prey well enough through the scope to determine that nearly all of the insects that were brought to Junior were cicadas. It was interesting to watch the adult as it hunted low over the forest canopy. It apparently trolls the tree tops waiting for a cicada to fly out, and then pounces. Quite a feat, as cicadas often fly like speeding bullets in direct lines. Here's a closer view of the adult with an insect. Not sure this one is a cicada. Whatever it is, Junior scarfed it up rapidly like everything else given to him. For one period of about an hour, he sat in the hickory and had twelve meals brought to him. As the adult neared the tree, it would quite deftly transfer the insect from talon to bill, then quickly hand it off to Junior and get out of there, the transfer normally lasting only a few seconds. A good look at Junior, holding a cicada. He/she is quite striking, with rich chestnut brown striping below and an intricate pattern of white feather edging above. Its prominently banded tail can also be seen here. I want to thank Rick Perkins for finding the bird and making us all aware of it. I'm especially grateful to Chad Galloway for taking an interest in the kites, and playing a key role in enabling us to document the successful nesting. This is the first nesting record for Mississippi Kite in Ohio and as far as I know, the northernmost nesting record anywhere to date. Lets hope they return next year. We'll go back in in December after the leaves have fallen, and see if we can't find the nest. We have a strong idea as to the locale, but dense leaf cover has kept it hidden from us so far. I gave a program on fall warblers last night in Darke County, at the nature center at Shawnee Prairie Preserve. This is an interesting place, and many prairie plants have been planted around the building. As I walked into the place with my gear, I couldn't help but to notice a number of one of our showiest butterflies, the Painted Lady, Vanessa cardui. They were nectaring primarily on sunflowers in the genus Silphium, and lucky for me I'd thrown the camera in the car. Painted Ladys don't do well trying to overwinter in cold climes, and ours are probably all immigrants from the south. Some years, there are very few; in other years Painted Lady can be fantastically abundant. There are historical descriptions describing tens of thousands seen in Ohio in boom years, but that's not the norm. 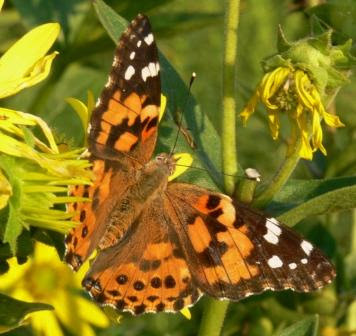 This species resembles the American Lady, Vanessa virginiensis, but differs above in having more black markings among other characters. Painted Lady is especially striking on the underwings, which are elaborately scribbled with fine line drawings and also beset with small dots. 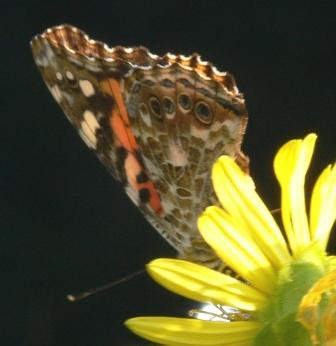 The similar American Lady would have two much larger eyespots rather than the four small spots of this species. While often uncommon and local here, this may be the widest ranging of any butterfly. In addition to North America, they occur in Africa, Europe, and Asia. In North America, they are only found as permanent residents in Central America and Mexico, but northward immigrants have been founds as far north as Alaska. I spent the day in Adams and Scioto counties in southernmost Ohio with a nice bunch of folks. We were led by naturalist extraordinaire John Howard, who knows the area as well or better than anyone. Our mission? Great Purple Hairstreak. An exceptionally showy butterfly, the hairstreak's host plant is mistletoe, Phoradendron leucarpum, which is almost entirely confined to the Ohio River Valley in Ohio. There is only one old record from Ohio, although it must be down there somewhere. While we failed to find the hairstreak, we found thirty-nine species of butterflies in total, including many interesting ones. Included in the total were many Cloudless Sulphurs and Little Sulphurs, both immigrants from the south. Until today, I had seen only one Cloudless and no Littles this year. Below are some shots taken today. Pipevine Swallowtail. A challenge to get a good shot, as they are very jittery feeders and in constant motion. This one is nectaring on Field Thistle, Cirsium discolor, one of our native thistles and a real butterfly magnet. An Eastern Tiger Swallowtail, also drawn to the field thistle. Thistles are often regarded with loathing, thanks to the invasive Canada and Bull Thistles. The natives are anything but invasive, rather showy, and as attractive to butterflies as the milkweeds. Buckeye. We saw a number of these today, and they are likely immigrants from the south. Buckeyes are incredibly territorial, shooting out after anything that flies near, from other butterflies of any species to wasps, bees, and even dragonflies. I don't know what they think they're going to do if they catch one of these. Find of the day, without a doubt, was a colony of Hayhurst's Scallopwings. This is a male. It was a "life" butterfly for everyone, although John knew what it was right away. They are southerners, barely ranging into Ohio, although their host plant, Lamb's-quarters, Chenopodium album, is absolutely an abundant weed. Overall they are rare in Ohio. Red-spotted Purples are one of our showiest butterflies, and we had quite a few today. Their hosts are trees in the Salicaceae: willows, aspens, cottonwoods, etc. This individual is old, showing significant tattering of the wings and faded colors. Man, this was a tough one to get a photo of! We saw a number of these Checkered Whites, which are like Cabbage Whites but much more heavily adorned with dark markings. They hardly ever stay still though, and it's pretty easy to dismiss them as the ubiquitous Cabbage Whites from afar. This one stopped for about 2.7 seconds to grab nectar from Buttonweed, Diodia teres, an interesting little plants of dry open soils. While not a butterfly, still a very cool lepidopteran. This is a "hummingbird moth", Hemaris thysbe or possibly diffinis. They are actually mimics of bumblebees, which is probably a pretty good deterent to keep things from trying to snap you up. This is also a rare moment of repose, as these moths are usually seen on the wing and can be hard to photograph. Had to toss in this interesting botanical find. It's Raccoon-grape, Ampelopsis cordata; first time I've seen it in Ohio. We found a small colony on a rather weedy floodplain of the Ohio River, but it is native. Raccoon-grape has only been collected in six southernmost counties and seems to be rather the rarity. I'd be interested in learning more of it's status and distribution in Ohio. Common Sootywing. We saw a number of these today, and at a distant glance they appear rather unremarkable. Get them close and in good light and sootywings are very showy; dark brown with the hind wings edges burnished with a coppery color. Gray Hairstreak. We also had a number of these. Their underwings are a dove-gray, set off by brilliant orange-red spots. Most hairstreaks habitually rub their hindwings together when perched. 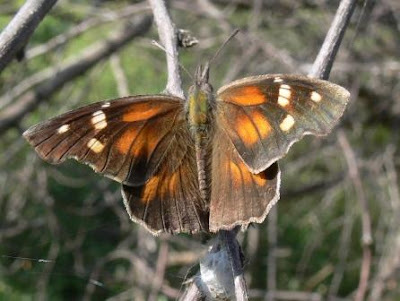 Thus behavior is thought to be a ploy to direct potential predators' attention to the hindwing region, and if they make a grab for the butterfly, they may only end up with a bit of wing and the hairstreak can still make its escape. This one is feeding on Wingstem, Verbesina alternifolia. For a skipper this was a real showstopper, and I wished I could have gotten a better photo. They were not cooperative, however. It is a Checkered Skipper, which is probably another immigrant from the south. This is one of three species of fritillaries that we recorded today, a Variegated Fritillary. The others were Meadow and Great Spangled Fritillaries. Variegateds are yet another immigrant from the south, but we saw a pair in tandem, and a female laying eggs in violets. 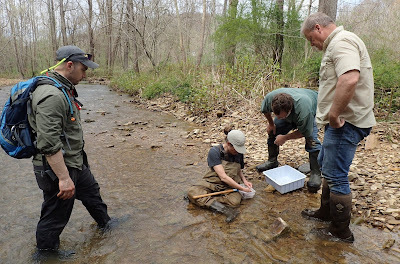 As the climate steadily warms, it will pay dividends to monitor butterflies and document northward range expansions. Of all the groups of animals, butterflies will likely be the fastest to respond to temperature changes and the easiest group to record range expansions. A whole new world emerges after nightfall. Creatures that lay in hiding during the day emerge, and do their thing. I went out for an hour or so tonight to a local patch of woodland, mostly to hone my insect songs ID skills. And I heard plenty. Those that I felt pretty good about recognizing included: Texas Bush Katydid, Sword-bearing Conehead, Narrow-winged Tree Cricket, Fall Field Cricket, Carolina Ground Cricket, Broad-winged Tree Cricket, Snowy Tree Cricket, Common True Katydid, Greater Anglewing, Lesser Anglewing, and Oblong-winged Katydid. Thee were others, too. Nighttime insects create an interesting symphony, and once your ears become somewhat attuned, more individual players than you might suspect make up the band. Birds no doubt drive this abundant nocturnal insect activity, at least in some part. After all, there are no insect-eating birds out after dark, and it's safe to come out if you are a bug. So not only do the seemingly harmless and sometimes melodic insects become active, so do many of their insect predators. I also had my camera and flashlight along, and managed a few pics of various critters. I don't know what must of them are, and haven't yet had time to try and figure them out. Hopefully Ethan Kistler or Phil Chaon will clue me in if they have time. This insect, which I believe may be a Texas Bush Katydid, was lurking about in a Wingstem plant. The predators really come out at night. Just carefully inspect tree trunks, and you'll see. Harvestman (Daddy Long-legs) were hunting all over the place, as were many spiders. This is some sort of funnel spider. He was wide awake and lurking at the entrance to his silken cave. If an insect happened into the web, it would dart out at lightning speed and it'd soon be all over for the hapless victim. A closer look at the funnel web spider. I wouldn't want to tangle with it. This spider was more mobile, apparently working leaf surfaces for prey. One of the inchworms or loopers - a caterpillar of a Geometrid moth. It was dangling from a strand of silk. There were quite a few caterpillars out. Many are nocturnal, holing up for the day and emerging at night to feed on vegetation. After they ravage some leaves, most caterpillars move well away from the partially eaten leaves before daybreak and bird activity. It's thought that at least some species of birds can key in on caterpillar leaf cuttings, so it behooves the caterpillar to leave the area. A big boy, this spider was building a web on my front porch. About the size of a half dollar, he very systematically constructed a beautifully concentric web to very exacting standards. Then, I'm sure it will catch many of the moths that are attracted to my porch light. Some butterflies, particularly skippers, can be tough to identify. The American Snout, Libytheana carinenta, is not one of them. Anyone could identify this distinctive species. In fact, when spotted for the first time, a common exclamation is "Look at the nose on that butterfly" or something to that effect. I helped lead a group of people around Cedar Bog last weekend, and we had the good fortune to come across a snout. Or, more accurately, it came across us. Maybe it was attracted to the flowers on one of our participant's shirt. Probably not, though - like some other butterflies that use Hackberry, Celtis occidentalis, as a host plant, snouts can be pugnacious. This one boldly confronted the group, landing on various people and permitting close inspection of one of our stranger butterflies. The undersides of the wings are not very showy, resembling dead leaves, but the palps (snout) is very distinctive. There's nothing like it. The upper wings are quite showy, if you are fortunate enough to catch a snout with wings open. I took this photo last November in Texas. Butterfliers in Ohio get rather excited about finding American Snouts, as they are fairly uncommon and almost exclusively confined to glaciated regions of Ohio. Their host plant, hackberry, is a tree of alkaline soils so it is most common where limestone is near the surface such as at Cedar Bog. One's perspective of the American Snout will be radically different in the southwest. There, it can be abundant beyond belief, sometimes staging enormous migrations. 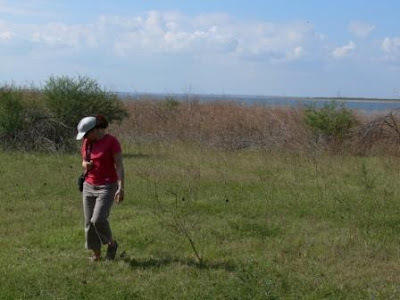 This photo is of Lisa Casamatta walking through a field near Falcon Dam in south Texas last November. Although hard to see in the photo, every little dark fleck is a snout. There must have been many thousands in that small area, and all told, in my week in the Rio Grande Valley, I may have seen a million or more. Way too many to even begin to estimate accurately. There were so many snouts in south Texas last year that I even so Sanderlings pursuing and eating them on Gulf of Mexico beaches! So, sometimes rarity is all a matter of regional perspective. Mark your calendars for a very special workshop on Aug. 30 , 2007 from 8:00 am to 4:00 pm. This fascinating workshop provides naturalists, volunteer teachers and others involved with non-formal education an opportunity to explore complex global and local environmental issues that are impacting neotropical songbird migrants and Audubon’s ten watch-list bird species. Nationally recognized experts such as Kenn Kaufman, prolific author and legend among bird watchers, Jim McCormac, author of Birds of Ohio, Kimberly Kaufman, education director of Black Swamp Bird Observatory, and Patty Rickard from Flying Wild will share their expertise on these critical issues. · Which species are of concern and what are the factors of greatest significance? 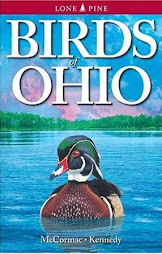 · Where are the locations in Ohio that meet the critical needs of birds? 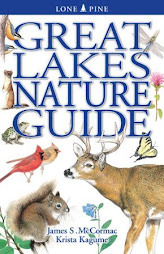 · Learn how to create a community for young birders in Ohio. · Discover ways to create an interest in natural history and encourage young people to spend time outside. · The unknown is all around us, beginning right outside. The power of personal observation can rekindle our sense of wonder if we take time to observe nature. Look at the world of birds and remember that we are surrounded by mysteries! · Discover an exciting educational program that engages middle school students in bird related activities and empowers young people to create birding festivals in their communities. Participants will be provided with many useful handouts from these specialists and lunch. Attendance is limited to 35 registrants. Books by Kenn Kaufman and Jim McCormac may be purchased in Aullwood’s Nature Store and the authors will be available to personalize books. Thanks to Ethan Kistler for pointing out my misidentification of the alleged Greater Angle-wing. It is actually a species of Round-headed Katydid (genus Amblycorypha). There are a dozen or so of those around, and they are apparently tough to ID to species. Angle-wings lack the brownish coloration on the haed/nape area. Ethan is rapidly becoming one of Ohio's premier entemologists, birders, and overall naturalists. You've maybe seen his posts on the Ohio Birds listserve, but his depth of interests goes way beyond birds, obviously. See his blog here. Bugs are cool. Actually, I must be careful about that "bug" term; they are really insects. And I saw a few interesting ones while out and about this weekend. The first is a wicked-looking critter, the Great Black Wasp, Sphex pensylvanicus. I bet you've seen these, too - they are hard to miss at over an inch in length, with shiny irridescent bodies. Rather showy, actually. Two Great Black Wasps nectaring on Swamp Milkweed, Asclepias incarnata. Although here's a pair, they just happen to be drawn to the same plant. This species is one of the so-called solitary wasps and generally are loners. Like butterflies, they are drawn to palatable nectar such as is produced by milkweeds. another name for them is "katydid-killer". They make subterranean burrows with small chambers at the end, and after stinging and immobilizing a katydid, haul it back to the burrow and drag it within. Presumably eggs are then laid inside the katydid's tissues. Better to keep the host alive and essentially paralyzed, so when the young wasps hatch, the larvae have a fresher meal. Not sure I'd want to come back as a katydid and have that be my fate. Speaking of katydids, here's one - potential Great Black Wasp prey. I photographed this Greater Angle-wing, Microcentrum rhombifolium, at Bigelow Cemetery, subject of the last blog entry. It is on the foliage of Scurf-pea, Orbexilum onobrychis, which is common in this tiny prairie remnant. In an amazing bit of evolution, these insects have developed a morphology that exactly matches that of a leaf, from overall shape to the venation of the wings, which matches viens on a leaf. You've heard these. They are common nighttime singers nearly everywhere, making a rapid series of metallic clicks, or sometimes a single rasp. Some are singing outside my window as I type. Go here to hear a Greater Angle-wing. Hi all, and it's good to be back and have some time for posts! I have been more than busy of late finishing up a book, and just handed in the manuscript to my publisher last Friday. Oh, what a relief it is :-) Wasted no time getting afield, and in a twist of good fortune, my route today took me right by Bigelow Cemetery in Madison County. Doing anything other than stopping was out of the question, and I picked up my dusty camera and photo-documented this wonderful micro-prairie. Bigelow is a pioneer cemetery in the middle of the former Darby Plains, one of Ohio's great prairie ecosystems. Blanketing parts of Franklin, Madison, Fayette and other counties just west of Columbus, this tallgrass prairie would have been a sight to behold to the first pioneers. Stands of Big Bluestem and Indian Grass grew so luxuriantly that a man on horseback could scarcely see over them. Prairie fires regularly swept the landscape; horrifying spectacles to prioneers, no doubt. Dr. Jeremiah Converse, an early pioneer, wrote: “The blaze of the burning grass seemed to reach the very clouds…[flames] would leap forty or fifty feet in advance of the base of the fire. Then add to all this a line of the devouring element three miles in length, mounting upward and leaping madly forward with lapping tongue, as if it were trying to devour the very earth, and you have a faint idea of some of the scenes that were witnessed by the early settlers of this country”. Today, all that remains are postage stamp-sized remants; well under 1% of the original Darby Plains. Bigelow Cemetery is one of those relicts and every Ohioan should visit it to see what a big part of Ohio's natural heritage was like. Prairie flora abounds in tiny half-acre Bigelow Cemetery. Here, the massive leaves of Prairie-dock are set off by Purple Coneflower and Gray-headed Coneflower. Bigelow seems inordinately lush with flowering prairie forbs, and Gary Meszaros, my collaborator on the new book, has a theory which explains this. Prairie pioneers, as no florists were available in those days, gathered brightly colored flowers from the prairie and planted them around the headstones. They persist in abundance to this day. At this time of year, butterflies abound, seeking the nectar of late summer prairie plants. This Eastern Tailed Blue is working a Gray-headed Coneflower. I saw many other species in my short visit today. Masses of Monarchs are drawn to prairie remants, especially attracted to the bright yellow blooms of Prairie-dock, which are held high aloft like luminescent beacons. Things went badly for the couple above, though. Apparently locked in tandem, they bumbled into the web of this orb weaver spider, which got a two-for-one meal. One of the real prairie stars is Royal Catchfly (Silene regia). This plant is a prairie obligate, not occurring outside of prairie areas, and is now listed as threatened in Ohio. Bigelow is filled with them. Most were done, but a few still stood in good flower. The modern prairie clashes with beautiful native prairie vegetation of Bigelow Cemetery in the foreground. Beyond lay thousands of acres of soybeans, along with wheat and corn. In 1837 John Deere launched his chisel plow, and rich prairie sod - some of the world's most productive croplands - quickly were converted. That's the fate of nearly all of the 1,500 square miles of prairie that once cloaked Ohio. It's too bad that we didn't have the foresight to set aside large swatches of Bigelows long ago, so Ohioans could enjoy the prairie landscape that was so prominent a part of our history. Yes, indeed, those confusing fall warblers are guaranteed to drive a birder batty. Not! Roger Tory Peterson did many great things in a long and storied career, but coining the phrase "confusing fall warblers" may not have been among them. It's catchy and has stuck, and now many birders think warblers in fall are as hard to learn as advanced calculus. Sure, some species do look similar, and pretty much none of them are as vibrantly colored as in spring. And they sure aren't singing in fall, either. But on the plus side, there are more warblers to chase around in fall migration, as their numbers are bolstered by youngsters fledged that summer. In any event, the Ohio Ornithological Society, Black Swamp Bird Observatory, and Toledo Naturalists' Association is pleased to host a Fall Warbler Symposium September 8 & 9 at Lakeside along the shores of Lake Erie. We'll have a star-studded cast of speakers on Saturday, and wonderful trips afield on Sunday. That weekend is pretty much the peak of fall warbler migration, and we should find plenty; maybe even some Connecticut Warblers. Jon Dunn, who wrote the Warblers field guide for the Peterson series, will be speaking. So will Kenn Kaufman. Bill Evans will be there. So will Elliot Tramer. All are accomplished speakers, and know mucho about warblers. You won't want to miss them. The Grand Finale will be Victor Emanuel, making his first Ohio appearance. Victor is a legend, and has been all over the globe. He founded VENT, perhaps the world's most respected ecotourism company. He'll be on stage Saturday night. Field trips will hit all the great birding hotspots along western Lake Erie, led by experts. You won't want to miss this one. These symposia are always a blast and a great way to meet other birders from all over the map. Go RIGHT HERE for conference info and registration. John Gallagher, the feisty environmentalist who lead the fight in the late 1960s to stop U.S. 68 from being extended next to Cedar Bog, died Tuesday afternoon in Community Hospital. He was 83. By profession an insurance agent, Gallagher was passionately Irish and passionate about nature, founding the Clark County Audubon Society in 1964 while taking a bird-watching class from then Wittenberg University Professor Louis Laux. "About three-quarters of the way through the course, it was John who got up and said, 'We can't end here,' " Laux said for a 1998 story. "Once John got this on his mind, we had an Audubon Society." Fearing noise and pollution would ruin Cedar Bog's ecosystem, Gallagher brought the same determination to fight a plan to run U.S. 68 beside the nature preserve. The grass-roots battle "lasted nine years, and I spent almost full time on it," Gallagher said in an interview with the News-Sun. "I just couldn't give up. "Maybe it's the damned Irish in me," added Gallagher, a longtime officer of the local Irish Fellowship. Although he had no children of his own (wife Pauline died in 1986), he was tremendously proud of the young people he brought into the environmental movement, calling them his boys. Among them are Neil Bern-stein, winner of the Distinguished Science Teaching Award from the Iowa Academy of Sciences; Kevin McGowan, an ecological researcher at Cornell University's Laboratory of Ornithology; David Westneat, a behavioral ecology and zoology teacher at the University of Kentucky; Bret Whitney, a renowned nature tour guide who has identified several species of birds; and John Horner, once named Educator of the Year by the Environmental Education Association of Washington state. 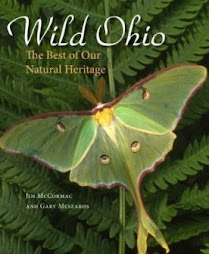 Gallagher's gift of gab was honored in 1989 when the Ohio Department of Natural Resources named a state nature preserve in Clark County for him. He was moved to tears by the surprise, and the headline reporting the dedication read: "For once, he was speechless." A funeral Mass will begin at 10 a.m. Friday at St. Raphael Catholic Church. Burial will be in Calvary Cemetery. Memorial contributions can be made to the Clark County Audubon Society, 207 Larchmont Drive, Springfield, OH 45503, or St. Raphael Church. Gallagher Fen State Nature Preserve in Clark County, Ohio - named in John Gallagher's honor. It is one of the finest remaining fens in Ohio, and harbors many rare species. 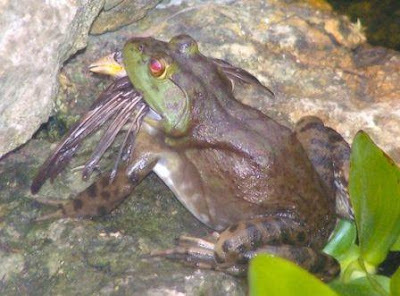 Bullfrogs are the bruisers of the amphibian world. A whopper can tape out at eight inches. Lotta frog leg to an animal like that. Their voracious appetites and gaping maw are a bad combo for anything smaller that wanders near. They'll eat big dragonflies, large butterflies, crayfish, small snakes and little turtles, mice, salamanders, and other frogs. Even birds. I've heard of a few reports of bullfrogs snapping up Ruby-throated Hummingbirds, and several species of songbirds are recorded as sliding down the gullet of big frogs. Well, today Gina Buckey sent along a photo that her friend Mark Eller took in a Clintonville - suburb of Columbus - backyard. Apparently this guy hangs out in a small ornamental pond and patiently awaits opportunity. Mark finally caught him in action - a juvenile Northern Cardinal fast in the jaws of the killer bullfrog. And it is a male; they have larger tympanums - eardrums - than do females. He reports that this particular frog makes a habitat of catching birds, and they've seen several other bird species meet their demise this way. Maybe they should have shown this photo to all those uninformed elementary school kids that wanted to make this the state's official amphibian a few years back. Me, I'll vote for tiger salamander. I went up to the International Headquarters of Black Swamp Bird Observatory today, to join in with the 1st possibly annual Artists and Authors Event. A great time, met some nice people and saw many more that I know but don't often see. Thanks to all who assembled this event and made things flow so well. There was a bit of time on either end of the event to poke around the vast marshes of Magee Marsh Wildlife Area. Many know this place is a beacon for birds, and it is. But there's much more. The big marsh on the east side of the causeway road as you head out towards the legendary bird trail is the second best marsh in the entire western Lake Erie basin - at least in Ohio - in my opinion. There are a number of very rare plants growing here, and other more common native plants that have been in a downward spiral in other marshes. Then, there is the beach. Not the one associated with the state park to the west; the one at the end of the causeway road where it jags sharply to the left. This beach is undisturbed and always has interesting flora and fauna. A view of the "good" beach. Interesting plants occur here, some quite rare. That zone of low grass is an example. It's Purple Sand Grass, Triplasis purpurea, which is threatened in Ohio and only known from Lake Erie beaches. This one's even cooler, and an equally rare denizen of Lake Erie beaches. Prostrate, it's adapted for life on the outermost limits of a beach, where waves regularly pulverize it. Seaside Spurge, Euphorbia polygonifolia, is an Atlantic Coastal Plain disjunct. About ten tousand years ago, it migrated eastward into the Great Lakes via interconnected bands of lakes and wetlands that were present following the retreat of the Wisconsin glacier, and was eventually stranded inland. Blue Dashers galore in the Staghorn Sumac thickets on the back side of the beach. This male was one of probably hundreds - thousands if one looked far and wide enough. This beach seems to attract droves of dragons, and is a great place to watch for rarities, like the state record Striped Saddlebags that Rick Nirschl found here last year. I found this plant growing in dry sandy soil around the entrance to the bird trail. It's not one I've seen in Ohio and threw me at first. I thought it might be a Potentilla, but when I got back and had a look at the digital images the lightbulb clicked and I remembered seeing it elsewhere - Puncture Vine, Tribulus terrestris. It's in the Caltrop Family, Zygophyllaceae, and is native to Eurasia. The only member of this family found in Ohio, it is known from only a handful of counties, but is considered a troublesome weed elsewhere. You may recognize the genus name, Tribulus. It is commonly sold in health food stores as an hebal medicine, touted for improving sexual function among other things. The day ended with a bang. A bunch of us were standing around, getting ready to leave, when in came a call from Larry Rosche, who along with Judy Semroc had just discovered a Piping Plover on the beach in nearby Port Clinton. This was pretty much on the way home and I'll always make an effort to look at a Federally Threatened species, so off to the Port it was. No disappointments on arrival, either. Larry and Judy were still there and had the bird in sight. It's a juvenile, just born this summer, and had a band on its leg. Dave Lewis, Judy and Jen Brumfield all got great shots - this one is mine - and we might be able to see the legs better in one of theirs. If so, we'll send a pic off to the Federales and see if we can't find out where and when it hatched. A beautiful little beast; very pale and showing the scaly feather edgings of a juvenile, it also was very vocal. Piping Plovers emit a pleasant, mellow two-toned whistle. Managed this pic of the bird in flight. It's at right, showing a bold white wing stripe sandwiched by extensive blackish areas. That's an adult Sanderling, in obvious molt, leading the way. We appreciate Larry using a telephone - just like the olden pre-Internet days - to tip everyone off so we could get there in time to see this rarity.